"Creating lasting tributes for those we love"
We are a family team, father and son, having over 35 years in the memorial business. We call the Wilmington area home. Our business reaches the far expanses of Eastern North Carolina and some of South Carolina. It's a great life living and working here making new friends on a daily basis. It is truly amazing how much out of state business we do without ever meeting our customer face to face. 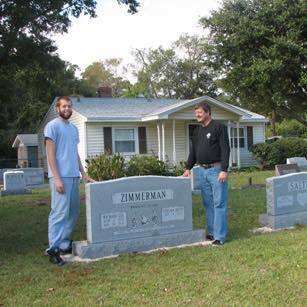 No matter where you call home, if you need assistance with a monument, marker or mausoleum, we are the people to see. Please browse further and see some of the beautiful and artful memorials we have produced! I just wanted to tell all those concerned how happy I am with the custom double headstone that Family Stone Works made for my late husband and me. I knew I wanted something a little different than what I had seen in the many catalogs I had previewed. I contacted Wayne and he was very instrumental in helping me design just the right stone for my needs. My husband was one of a kind and I wanted a headstone to reflect that. Wayne went right to work and after a brainstorming session between the two of us, he seemed to understand what I wanted. Within a few days, he contacted me with a preliminary drawing. After the stone was ordered, Wayne gave me a target date that it should be ready. Because it was a custom piece, I expected it to take longer than he had said, but it was delivered when he said. Wayne came out and set up the stone and did not leave until I was happy. I have had so many compliments on the stone that I feel very much at peace with what we came up with. I am sure my husband would be pleased also. I will be sure to send all my Pink Hill friends and family to Family Stone Works' for all their monument needs. On behalf of the Dolphin Ridge Royal Oaks property owners board of directors I would like to extend a sincere "Well Done" on the installation of our new entrance sign. The professional manner in which you approached the entire project was noteworthy. The granite was cut to perfection and the end result has resulted in many positive comments from property owners. We could not be more pleased with the ease of working with you and your willingness to provide a first class project. Going the extra mile to get it right in this day and age is rare and we appreciate your positive work ethic and can do attitude. I personally put a high mark on recommending you for any future projects here or anywhere. I wanted to let you know how much I appreciated the help you provided to me on 1/7/2013. Your advice on helping me make the right choice on buying a monument for a friend. Since I am co-executor, your help was helpful. I really appreciate your kindness and knowledge on which one would be the right one for my friend. I will be happy to refer anyone to you and your company, and know that you will be truthful in making the right decision. Thank you for the beautiful job on the stone of my dad Charles Harrison.